Description of "भूलना भूल जाओगे- Forget Forgetting (Bhoolana Bhool Jaoge) (eBook)"
Reviews of "भूलना भूल जाओगे- Forget Forgetting (Bhoolana Bhool Jaoge) (eBook)"
This book has all the memory techniques that are typically taught in memory courses and other memory books. Even if they are sometimes introduced by other names, all of the techniques are variants and combinations of word-substitution link, peg, loci and phonetic (letter for number substitution) systems. The book is mostly re-hashed information that has not been presented earlier, but the writing style makes it a book worth keeping. The real strength of this book over others of its kind is the illustrations. They are fun to read and almost never get boring. 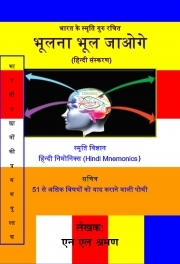 It is a "Hindi Mnemonics" a better book, it's more complete a reference and gives much more of the why of memory rather than just the how of remembering. Depending on your needs, you might like this book more, it's got more examples on how to use the systems it introduces and is much lighter and a little less dry. As with every other memory book, the techniques take no time to learn and effort, but work very well within a hour . For a book on memory techniques, this book doesn't disappoint.